Last night's dinner was so good - especially after an afternoon of running around, I was able to come home to dinner nearly ready to go. I made a pot of "drunken beans" in the crockpot (2 qts. water, 4 cups pinto beans, 12 oz dark beer, 1/2 cup jarred jalapenos, 1 tsp oregano, 1 onion, 3 cloves garlic and salt in crockpot on high all day) and roasted some peppers and onions in the oven. Other toppings were guacamole, Wildwood soy sour cream, a fire-roasted salsa (hot!) and some Follow Your Heart monterey jack cheese. Excellent. The leftovers beans make a wonderful bean dip if you throw them in the food processor and process until smooth. omg, this sounds (and looks) fabulous too! Totally up my alley... 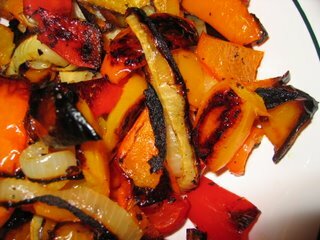 I love roasted veg, and am so into burritos lately... yum! Yum! You make the best dishes, seriously! Hi, sweetie! The beans sound wonderful. We got *snow* last night -- expect anything in Oklahoma -- so these will be fab for dinner. Thanks for the inspiration. But, then again, you've been inspiring me for a long while.